The mDesign Kitchen Lid Organizer is perfect for cabinet organization or pantry storage. Declutter cabinet shelves by storing reusable lids upright and all in one place! 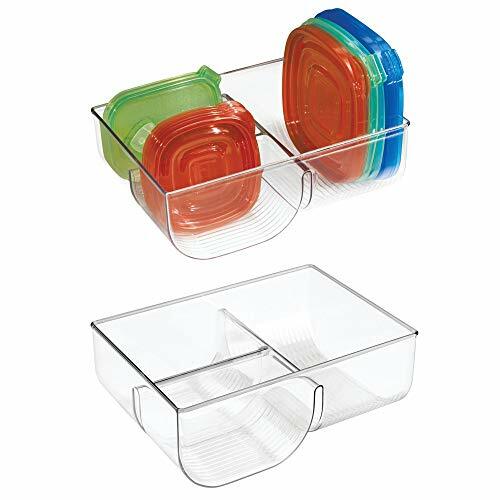 This lid organizer holds approximately twenty-six small lids and twelve large lids. Works perfectly A bit pricy for a plastic bin to put my plastic lids into, but it’s the perfect size and it’s not flimsy!Instantly made my plastic ware drawer less frustrating :)I used museum putty (sticky tack) to help it not slide around. Although the item is sturdy, the photos displayed made product appear to hold … Although the item is sturdy, the photos displayed made product appear to hold a variety of sizes. In fact none of my standard size lids fit well. You have to slant them which defeats the purpose. I won’t bother sending back but would not have purchased had the product been photographed accurately.